A master at his craft, Ryan Crowley is well known for his ability to shut down some of best players in the league. The former Docker joined the Bombers at the beginning of the 2016 season to bolster the side's midfield. 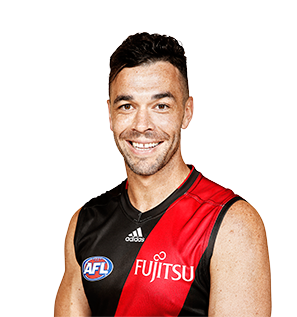 An elite tagger, the 31-year old's experience will be invaluable to the younger Bombers. Crowley did not play a game in 2015 after he was suspended for a year for taking a banned substance. Despite the setback, Crowley trained hard away from the Dockers, maintained his fitness and was ready to comeback toward the end of the season. He would not be given the chance and was unfortunately delisted at the end of 2015. Crowley had another consistent season and remains one of the AFL's best taggers. Has not missed a game in the past three seasons and continues to mark the opposition's best midfielders and is rarely beaten. He kept Port Adelaide captain Travis Boak quiet twice in three weeks at the end of the season. Crowley again got the tough jobs on the star midfielders and he again performed his role brilliantly. Has evolved into the premier tagger in the competition under Ross Lyon. If there was ever a prime example that the Doig Medal rewards those who do their role for the team and do it consistently, then Ryan Crowley’s 2012 season is exhibit A. He enjoyed a tremendous season playing as a tagger. The list of star midfielders Crowley shut down on a weekly basis in 2012 was a who’s-who of Brownlow Medallists, All-Australians and club champions. He is now a club champion in his own right after winning the Doig Medal. The arrival of senior coach Ross Lyon and an improved fitness base following a grinding pre-season can be credited for reviving Crowley’s career at Freo, which, on Doig Medal night, he admitted was close to being over at the end of the 2011 season. Ryan Crowley had an up and down year in 2011. He played 19 games but he found himself omitted from the team on a couple of occasions throughout the season. At his best, he is an elite stopper in the competition, as some of his scalps in the past can atone to. What Crowley needs to do in 2012 is reassert himself as Freo’s premier midfield-minder. He has a fan in new Freo coach Ross Lyon, who has already indicated that Crowley’s tagging abilities will be an important part of next year’s structure. Crowley played 18 games in 2010 after appearing in only six the year before due to injury. He continued in his customary role as a run-with player, shutting down some of the AFL's best midfielders and attacking defenders. While applying a forward tag in 2010, Crowley also proved to be a dangerous goal-sneak, with a five-goal haul in round 14 against Port Adelaide the highlight.